Guided reading has always been a staple in my reading instruction. But, as much as I love guided reading, it is so easy (like scary easy) to have a jumbled mess of lesson plans, running records, and other random forms in piles upon piles at my guided reading table. 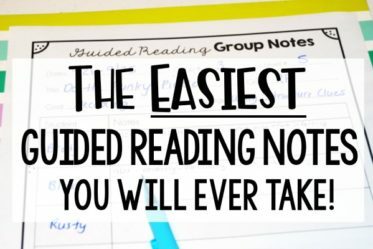 To combat this, I streamlined my guided reading binder into a super functional organizational tool with all the forms that I need right at my fingertips. In this post, I will share the forms I use and how I keep them all organized so I can quickly get to what I need. All of these forms are free and available for download so make sure and snag all the forms at the end of the post, after reading how to use them. All student data and information shown on the forms is fabricated to protect the confidentiality of my students. I have five sections in my guided reading binder: whole class section, groups section, individual student section, blank forms section, and a resources section. This section is where I keep all of the information for all of my students. This form allows me to see how all of my students are doing in a single glance. I use this form to help me group my students and determine my focus for my guided reading lessons. On the form, I list the students’ names, their guided reading levels, their strengths as a reader, and their struggles. I complete a new updated form each quarter. I use this form to group my students. I write students’ names under the group and each students specific level. In a perfect world, you would be able to have a group of students all reading at the same level. But, we know that just isn’t the case. After I have grouped my students (by looking at their levels and also looking at their strengths and struggles), I determine an overall instructional level for my group instruction. As you can see from the example, I use Fountas and Pinnell leveling. However, this form can also be used if you are using lexile ranges. In this section, I also keep my rotation chart and my group members form. I have included a few different forms in the download for you to use based on your needs. On this form, I keep track of which groups I meet with on which days. I try to meet with my below level readers four times a week, my grade level readers three times a week, and my above grade level readers two times a week. I further divide my groups section into tabs for each group. I keep a running list of each book that the group reads, the level of the book, and the genre. This helps ensure that I am exposing the students to a variety of genres, and that we are progressing through the levels. In this section, I also keep my guided reading group notes form. I have tried a few different ways of the years, but this is by far the most efficient and simple way to make sure I am keeping track of my students’ reading progress. You can read more about how I use this form by clicking HERE. My individual group lesson plans are also kept in this section. Look for a blog post in the next few months about my lesson planning process and template for guided reading. Next in my binder is my individual students section. I also have this section further divided up into tabs by individual student. I use Fountas and Pinnell Benchmarking Kits to benchmark my students. I benchmark all of my students at the beginning of the year and then my struggling readers at Christmas and in the spring. I move my groups up in levels in between benchmarking sessions, but these formal benchmarks are still super valuable and important data to have. Running records are how I determine if my students are ready to move up a level. I hope to write another post soon detailing how I conduct these. To sum up for this post, I complete running records biweekly on my struggling students and once a month on the rest of my students. I simply copy a page from the guided reading book we are reading and complete the running record on that page. I access their accuracy and complete a quick comprehension check. I keep copies of their running records in this section as well as the graph shown. The graph helps me track the data from the running records to see if my instruction is effective. Independent conferences are one of my favorite ways to connect with my students as readers. I keep my conference forms in this section of my binder. You can read more about how to get started with independent reading conferences by clicking HERE. This section is pretty self-explanatory. I keep blank copies of all the forms mentioned above in this section of my guided reading binder. What if You Use Lexile Levels/Ranges? As I mentioned above, I use Fountas and Pinnell levels, but I know a lot of schools do lexile ranges. All forms that mention a students level have two forms: one for reading level and one for lexile level. 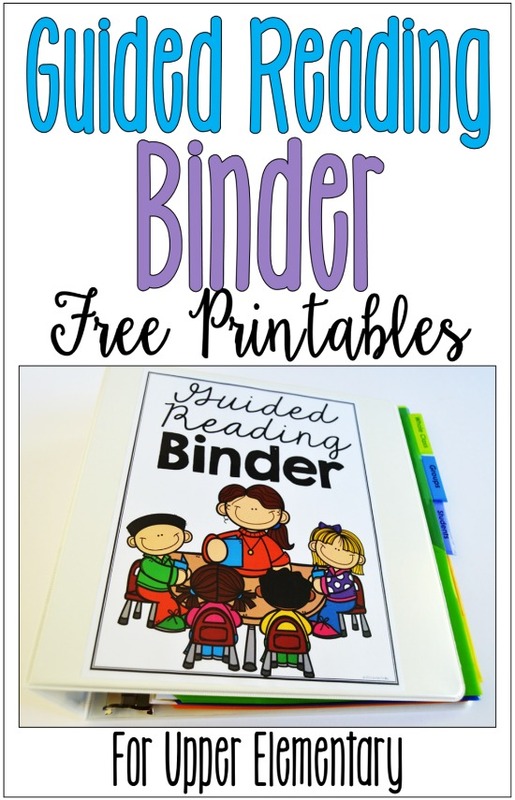 This binder is definitely one of the most important resources for guided reading. It allows me to track my students’ progress and reflect on their goals. 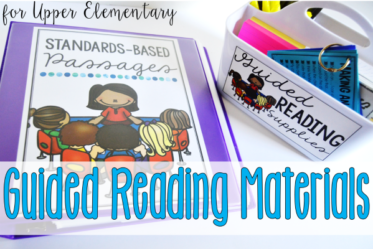 To see my other must-have guided reading materials, click here to read a detailed post of all of my favorite guided reading supplies and how I use them. To read more about how I teach reading, click HERE to read a detailed post that breaks down the different aspects of my reading instruction. And finally, to download all the forms shown on this post, click on the image below. Do you have a guided reading binder that you use? What are your go-to forms? Let me know in the comments. Thank you so much for sharing! Your blog is fantastic!! As a first year 4th grade ELA teacher, I cannot THANK you enough for this wonderful resource. I have been struggling with how to organize all of my guided reading materials and these freebies will be my saving grace! From the bottom of my heart, I thank you SO much for sharing!!! Aww, thank you, Chelsi! That makes my day that my resources are able to help you! You are very welcome! I have been teaching fourth grade for years, and I’m really ready to revamp my reading instruction. I have never done the traditional “guided reading”, as I have held individual conferences with my students. (Guided reading wasn’t really focused on in either my undergrad OR grad degree! Can you believe that?!) Your blog posts are helping me in so many ways, and I can’t thank you enough for the help you have provided. Thank you!! THANK YOU!! I am curious about something. Do you ever do whole-class books or book club groups? If so, how does that work in your reading schedule? I don’t see the links to the tabs that you use…I love that the tabs for sections stick out farther than the tabs for individual students! Those big tabs are my favorite to use! They also stick out further than pages in page protectors. I couldn’t find the group tabs on Amazon. I bought them from Office Depot. This is exactly what I need! Thank you so much for sharing and for making the forms free!! I have in my TPT cart some of your products and can’t wait to begin implementing them. Do you have something similar for Math groups? Fluency? Reports? These are great. Amazing things are happening in your classroom! Thank you for sharing! I can’t wait to use in my classroom tomorrow and share with my fifth grade team! Thankyou for these wonderful BLMs. Great organisation on every level which will set me up for the coming year. Can’t wait to use them and keep all data and information together. I often have two folders going sk this will make life simpler. Am sure work colleagues will love when I share with them, too. Thankyou so much! I am so thankful I stumbled across your blog!!! I have always wanted to do guided reading in my classroom, but have always been lost in the process of all the different components that it has never worked the way I wanted. I am very new to the blogging world, so I may have missed it, but I was wondering if you have written your post about your guided reading lesson planning process. I have read what the other students do while you are doing guided reading, and that you do independent conferences with students at the beginning of your guided reading groups, but I have so many questions on how you organize your lessons for guided reading! Are your books for your guided reading groups something you have purchased or through a program of sorts? Do you do novels with your guided reading groups? How do you know what strategies/goals you need to work on with your students? Thank you for the amazing and very useful resources! I’m so glad I found this blog! I will be starting guided reading groups next year. I have more than 5 groups because I have 36 in my class. Do you have a form with more groups? I just wanted to say thank you so much for having your forms as a freebie! I am a first year teacher and this is perfect. I’d love to see what you use for your guided reading lesson plan. You’re welcome, Jen! I hope to blog this school more in-depth about how I do guided reading lessons! I just want to say THANK YOU! 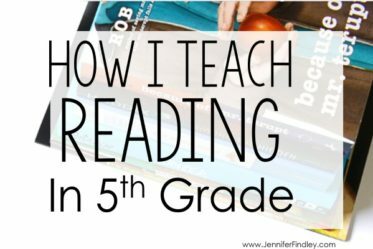 This coming school year will be my first year teaching fifth grade reading and this post has helped me so much! Thank you for taking the time and sharing I will definitely be looking for more to come! Thank you so very much! I can’t wait to use what I have learned from your posts! Thank you for this post! I have a question-how do you determine which comprehension strategies you will work on in your small groups? For the students who don’t need fluency so much, but need comprehension. I cannot thank you enough! You are amazingly kind and you are most inspiring! I have followed you ever since I found you through Pinterest and from then on, I am a huge fan! always will be! Oh my goodness!!! What amazing resources and insight! Thank you for all that you do..I can’t wait to use these fantastic materials. I can’t wait to read all through your blog. I just switched to 5th grade Reading and Writing from 4th grade. Thank you!